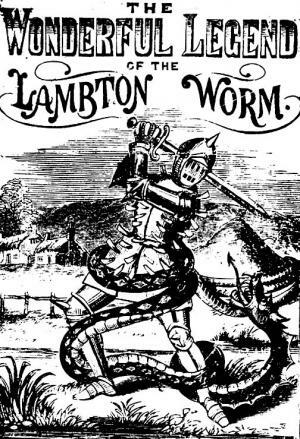 I awoke in the Travelodge having slept well – just like Lenny Henry promised. Wait, he’s Premier Inn isn’t he? Pfft, he should try a Travelodge for a change. Although I’m fairly certain the contractual obligations that came with the huge bag of money he received for promoting Premier Inn prevents him from spending a casual night in a Travelodge. Hmm, would Lenny Henry still command a fee that could fill an entire bag full of money in 2015? Maybe if it was in coins? I’m just raising more questions than answers here. 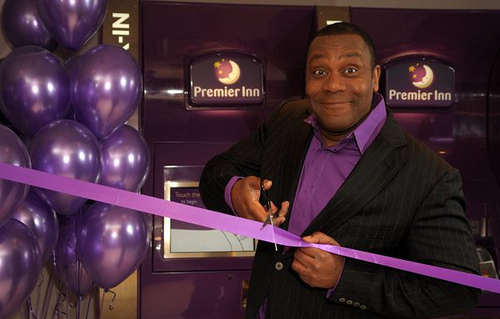 Lenny Henry: ambassador for Premier Lodge. Travel Inn. Whatever. Not pictured: huge bag of money. Half an hour later we returned to the breakfasting area where we spoke not of our earlier misplaced enthusiasm. Being something of a fan of the eat-as-much-as-you-can breakfast buffet, I showed considerable restraint owing to the fear of a full fry-up ‘coming back to haunt me at mile 7’. Fed and packed, we checked out of the hotel and headed back to the railway station. It was a glorious day. That’s running weather is that. At the station, two tickets to Musselburgh were duly purchased and we clambered aboard a train filled with runners. ‘Wouldn’t it be funny if we got to Musselburgh and, despite the train being full of runners all obviously going to the same run as us, we were the only ones to get off?’ said Jones as the train departed. We laughed heartily. Minutes later, we got to Musselburgh. And despite the train being full of runners all obviously going to the same run as us, we were the only ones to get off. When the hysteria died down, a glance at the race information indicated that the next stop down the line was pretty much right by the start. Getting off here, we’d given ourselves an unnecessary 1.5 mile walk and a 25 minute bus journey. Ah well. Couldn’t be helped. Well, obviously it could’ve been helped, if we weren’t disorganised bufoons, but still. Plenty of time. And the walk could count as a warm-up. The start of the race was delayed due to ‘last minute checks of the course’ (all of it?) which I think might actually have meant ‘because there’s still 47 million people queuing for a shuttle bus at Musselburgh’. But eventually we got away. It was not the most auspicious start, as the first couple of hundred metres were over a crumbling car-park where what quickly transpired was a mass-participation game of ‘dodge the potholes’. But we were soon on the road and away. I hadn’t given much thought to race tactics or whatever, but I did want to go faster than I had done at the Great North Run as I wasn’t dressed as Superman. Plus the course was downhill. It was, however, an unseasonably warm day. When I clocked my first mile as being around 7 mins 24 seconds, I made the decision to try and keep the pace at sub-7:30 miles for as long as I could, hoping I could keep that up until maybe mile 7 or 8. As it turned out, much to my disbelief, my first mile was one of my slowest. The course included numerous picturesque stints alongside the Firth of Forth and through small villages. As ever, people amazed me with their support and generosity (whilst running a half marathon is the only time you should take a Jelly Baby from a stranger, kids) and before I knew it I was on the final push. I’d paced myself superbly and managed to sprint (well, kinda) home in 1 hour 35 minutes and 34 seconds, shaving a massive 3 minutes off my personal best. I really must drink 3 pints of beer the night before every race, it seems. Although it’s fortunate I wasn’t picked for a post-race urine test, where I would have undoubtedly tested positive for ‘tomato sauce served from a small jam-jar’. Surely on the list of IAAF banned substances. Someone on high in the world of mass-participation running events has obviously concluded that it would be a nice touch if each runner had their finisher’s medal placed over their head at the finish like they’d just won Olympic gold, as this was the second time in a week where this happened to me. I wasn’t complaining though. And as for the medal – dear Lord, it’s as big as a bin lid and depicts a rampaging Scottish lion. When it comes to the formula that most folk use to rate a race, clearly the organisers of the Scottish Half Marathon had picked up on the fact that the figure is heavily weighted in favour of ‘the horghghghhghgh-ness of the medal’. Weighed down with 30 kilos of congratulatory metal, it was time to locate my baggage and get changed. At this point, my body (and one specific area of it in particular) reminded me that I’d forgotten to apply the pre-race Vaseline. A schoolboy error. Now, I once knew a man who had his foot run over. The attending medical personnel concluded that ‘leaving his boot on until he got to hospital as it was holding everything together’ was the correct course of action. I made a similar discovery here, as any interference with the intimate, un-Vas’d area was…unwise. But I overcame this with minimal cursing and only resorting to crying a little bit, before it was time to head back in the direction of the train station. On the way back, it was time to indulge in a little post-race treat. Statistics decree that you’re never more than 4-feet away from an Irn-Bru in Scotland, so it was time to take advantage of that truth and pick up a bottle of the orange stuff. And who can complain when you get purchase 750ml of vibrant, sugary deliciousness for a mere £1?! Well, perhaps parents concerned that the Sunset Yellow and Ponceau 4R colourings ‘may have an adverse effect on activity and attention in children’. But never mind them. They hadn’t just run a new half-marathon PB. Plus the drink came in a retro glass bottle which brought back fond childhood memories of handing back deposit bottles whilst on holiday in Whitby, and keeping the resultant 10p piece to use on the Teenage Mutant Ninja Turtles arcade game later. 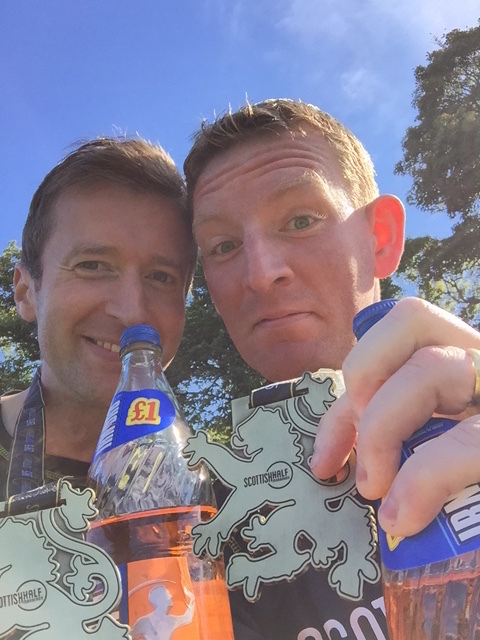 Irn-Bru and a huge medal. How all races should end. All in all, a top weekend. Great race, fine weather, top haggis, good beer, pleasing mountain film on a ginormous screen, new PB, lovely city and not being shivved by an angry, drunken Anglophobe . It’s all a man can ask. 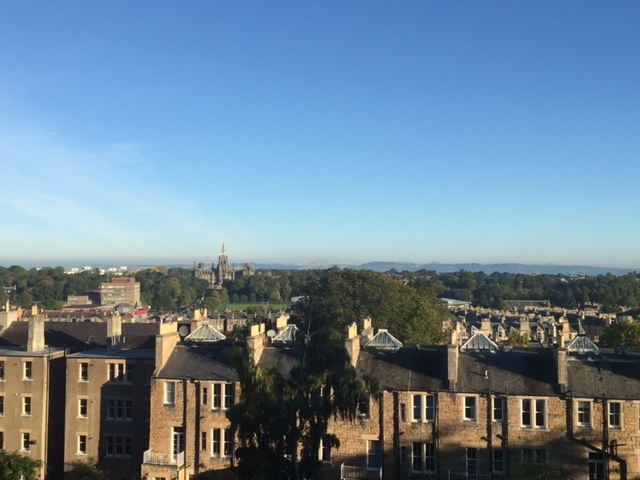 This entry was posted in Events and tagged edinburgh, exercise, fitness, jogging, marathon, running, running routes, scotland, scottish half marathon, training. Bookmark the permalink.